YANGON, Myanmar, May 8 (UPI) — Cyclone Nargis may have helped crack the Myanmar military junta’s nearly 50 years of closed-door rule, exposing its claims of self-sufficiency. The junta largely succeeded in ignoring international pressure during its brutal crackdown of the democracy protests last September, but after the cyclone’s devastation, it is left with no choice than to seek help from outside, the International Herald Tribune reported Thursday. There is still the government hesitation as seen by its slow response to accepting the aid and limiting access to foreign relief workers. But help has begun to reach people in the main city of Yangon and elsewhere in the Southeast Asian country, formerly known as Burma, which since the 1962 military takeover, has remained closed to outsiders. More than five days after a deadly cyclone hit Myanmar, vital aid is only just beginning to trickle in as aircraft loaded with much-needed supplies await clearance from the government to enter the country. Paul Risley of the UN World Food Programme in Bangkok told Al Jazeera that relief flights carrying emergency food and shelter were ready to take-off for Myanmar as soon as they were given the green light. “The government of Myanmar has assured us that they have granted overflight permission to these airplanes, yet the aircraft operators say they haven’t heard this word yet,” he said. He said that while reports indicated that one aircraft carrying high-energy biscuits had been given clearance, much more aid was urgently needed to prevent survivors from the cyclone succumbing to disease. The warning comes after a senior US diplomat in Myanmar warned that the death toll from Cyclone Nargis could top 100,000. Criticism of the Myanmar government’s handling of the crisis has been growing both inside and outside the country. Human rights group Amnesty International has said some donors were delaying aid for fear it would be siphoned off to Myanmar military. Anthony Banbury, the World Food Programme’s regional director, indicated that aid agencies had similar concerns. “We will not just bring our supplies to an airport, dump it and take off,” he said. United Nations: Will release a minimum of $10m, launching a “flash appeal” to raise much more money. International Red Cross: $189,000. Relief workers distributing drinking water, clothing, food, plastic tarpaulins and hygiene kits. Myanmar Red Cross: 5 billion kyats ($4.5m) for relief and resettlement work. Distributing insecticide-treated bed nets and water purification tablets. Australian World Vision: $2.8m for first month of relief operations. European Commission: $3m for fast-track humanitarian aid. US: $3m, up from initial $250,000 immediate emergency aid. China: $500,000 in cash; materials including tents, blankets and biscuits worth a further $500,000. India: Two naval ships loaded with food, tents, blankets, clothing and medicines sent to Yangon. Japan: $267,570 worth of emergency aid in tents, power generators and other supplies. Australia: Initial $2.8m in emergency aid, with $1m going to aid agencies to help provide shelter, water purification and food. Thailand: Transport plane loaded with food and medicine sent to Yangon. With an estimated 5,000 square kilometres still under water, disaster assessment teams say many of the most needy areas are accessible only by boat, with helicopters with relief supplies unable to find dry spots to land. 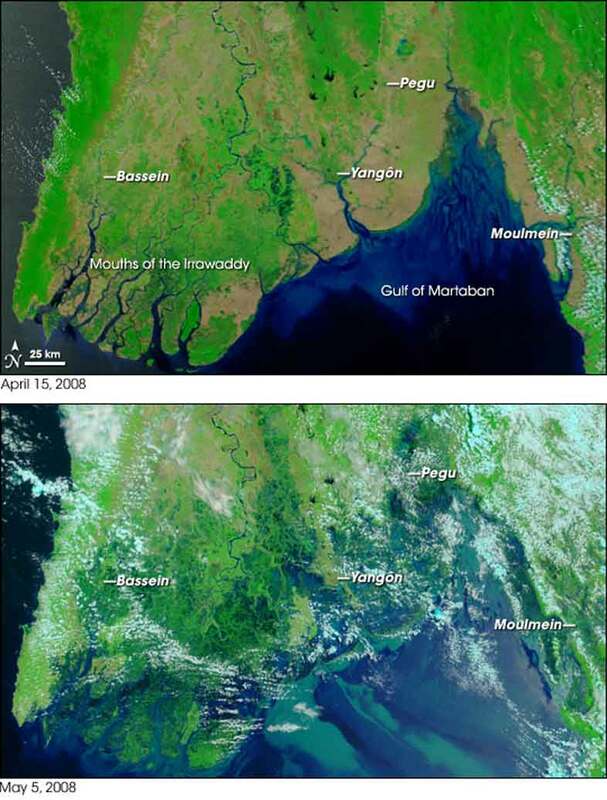 “Basically the entire lower delta region is under water,” Richard Horsey, the Thailand-based spokesman for the UN Office for the Coordination of Humanitarian Aid, said. On Wednesday Shari Villarosa, the most senior US diplomat in Yangon, said the number of dead could eventually exceed 100,000 because safe food and water were scarce and unsanitary conditions widespread. “We’ve been in touch with the Burmese Embassy here in Washington to encourage access for U.S. assistance and experts, and we have also been in contact with neighboring countries to Burma, including Thailand, Malaysia and Indonesia, to encourage them to use whatever leverage they may have with the Burmese government to allow assistance teams in,” State Department spokesman Sean McCormack said May 7. Christian aid agencies and leaders are keeping Burma in their prayers as they scramble emergency aid to the cyclone-ravaged country. Gospel for Asia’s more than 500 native Burmese missionaries are on the ground helping out in communities badly hit by last Saturday’s devastating Cyclone Nargis. Emergency aid arrived in areas of Rangoon Division and Laputta Township on Thursday afternoon, some six days after Cyclone Nargis devastated the region. However, aid agencies could not confirm whether aid had been delivered to Bogalay—one of the areas most affected by the disaster. Speaking to The Irrawaddy on Thursday afternoon, Veronique Terrasse, a communications officer for Médecins Sans Frontières (MSF) in Bangkok, said that some emergency food had been delivered in Rangoon and in Laputta Township in the Irrawaddy Delta. However, she could not confirm whether the MSF relief team had arrived in Bogalay, some 60 miles (96 kilometers) southwest of Rangoon, due to a lack of telephone communications. Meanwhile, the United Nations confirmed on Thursday afternoon that an airlift of supplies was being organized from the Italian port of Brindisi. Emergency Relief Coordinator of the United Nations and Under-Secretary-General for Humanitarian Affairs John Holmes stated that visas for the staff of non-governmental organizations and non-United Nations staff were also being discussed with the Burmese authorities. Sources in Rangoon said that the junta will reportedly only respond to the UN relief workers’ needs after the May 10 referendum. So far, foreign governments and international aid agencies have now pledged more than US $30 million in humanitarian assistance and technical support to Burma in the wake of the destruction caused by Cyclone Nargis. As the world watches this dramatic catastrophe unfold. The casualty numbers erupt. Collateral damage is the lesson. The world is not a bunch of isolated countries competing for market space anymore. The world is a complex intertwined community. A ripple on one side of the world can become a tsunami on the other side of the world. People and lives we will never see impact every one of us. The mounting death toll from catastrophes like this can erase memories and human potential. Its not always about market. The world may have lost a genius, a leader, a scientist, a family member or a friend. The death toll will mount as disease and hunger encroach upon the victims. A government that puts it’s political policy above the welfare of its population must answer to world scrutiny. These casualties are pieces of all of us. The Globe, as a giant organism, depends on each of its parts. Neglecting one part threatens the whole. Countries, religions and political factions that fracture a global family image are threats to the survival of the human species. “It’s more than frustrating. It’s a tragedy,” he said. The BBC’s Paul Danahar, in southern Burma, says that the devastation caused by the storm is apparent everywhere. Most of those killed were living in small communities among the patchwork of rivers and streams that make up the western part of the delta. It was via these inlets that the tidal surge washed its way inland, swallowing up entire villages, two or three hundred people at a time, our correspondent says. The ripple of global food prices and market shares will naturally follow this catastrophe. Whether humanity deserves to survive should not be the decision of a select few. Power is allocated by vote or violence. World powers should be made aware and scrutinized for their role determining survival or extinction of humanity. Catastrophes give the world an opportunity to set aside petty policies to focus on humanitarian aid. This was demonstrated after the Great Tsunami. Resources were gathered and shared by all. Factions will always spin catastrophes into rhetoric justifying their behavior. But, the world cannot allow those distractions to blur the big picture that we are all connected. This is a co-dependent world.